Categories: Blog. Tags: Aperture, Beginner, Lightroom, Software, test, Tips. There aren’t many applications of the sort that we would use for a fast and powerful photographic workflow. You could argue that, for the approach we advocate and support at Shoot Raw, there are only two real players: Apple’s Aperture and Adobe’s Lightroom (or Adobe Photoshop Lightroom, to give it its full name). The approach we take isn’t the only one. There are raw converters like Raw Photo Processor that aim to provide the highest resolution or the best sharpness (in the case of RPP, it succeeds admirably in those aims and it offers some integration with Lightroom to registered users—its user interface, though, is, shall we say brutally minimal); there are photo browsers (like Photo Mechanic) that aim to provide the fastest way to categorise your pictures and deal with metadata. But only Aperture and Lightroom aim to combine both the raw conversion and the digital asset management functions in one package and employ quick, friendly user interfaces and useful post-processing functionality. Both products have offered decent image quality for some time but both have also had their weaknesses. Many users are adamant that one or the other application is streets ahead for their particular camera; our experience has been that the default output Aperture 2.0 has been less blotchy and more pleasing at low light, high-ISO extremes but that Lightroom offered more control over the image and Lightroom 3 beta offers a stronger rendition throughout the ISO range. (It’s slow but we expect that to be addressed in the final release.) We haven’t yet tested specific new profiles offered for cameras like the Nikon D3 in Aperture 3, following complaints from some users of these cameras in Aperture 2. Above: Aperture 3 screen shot, with heads-up display (HUD) minimised. One area where Lightroom has had a clear lead since version 2 is in its ability to allow non-destructive adjustments to parts of an image. Exposure compensation, brightness, contrast, saturation, clarity (“punch”) and sharpness can all be brushed in or out or applied using one or more gradients. Using the brushes and gradients is quick and easy, and they can be combined and applied one over another. These adjustments are referred to as local adjustments because they affect only parts of an image—you brush them over (or apply a gradient to) whichever areas need them. Best of all, they’re entirely non-destructive—you can revist them at any point and alter them or remove them without any need to convert your raw file to something like a TIFF (as was the case with Aperture 2). Aperture 3 now includes similar brush functions to those used and loved by Lightroom users and closes what was probably the biggest gap between the two applications. 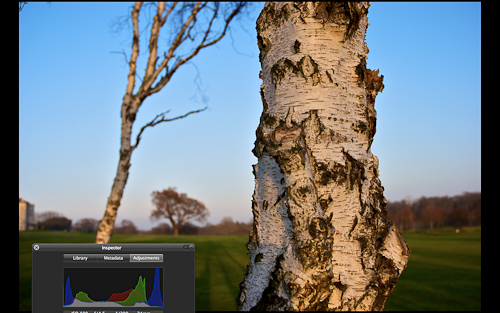 Lightroom 2 offers excellent sharpening for screen and print (using functionality from the highly regarded Photokit Sharpener plugin) for Photoshop. Aperture 3 offers soft proofing, using the ICC profile of your chosen printer/paper combination to give you a better idea of which areas of your image will cause a problem when you print, allowing you to deal with those problems, in advance, on screen. Both are useful functions and both applications will likely end up offering versions of them both. We don’t have any inside information but we expect Lightroom 3, due soon, to include soft proofing of some sort and retain its excellent print sharpening. Aperture 3 allows you to include video and audio inside your Aperture database. Lightroom users can add some of this functionality by installing Jeffrey Friedl’s Video-Asset Management plugin but it would be nice to have it built in. There are also differences in the two applications’ approaches to managing mobile libraries, with Aperture leading the way. This is an area where many photographers feel Apple has been lagging, though users of Nikon and Canon DSLRs in general won’t have had much to complain about. Adobe’s support for smaller and cheaper digital cameras that shoot raw has certainly been faster and more far reaching—for example, Aperture has just gained support for the Panasonic LX3 (released seven months ago) and still doesn’t offer support for the Panasonic GF1 (released five months ago), both supported in Lightroom for many months—but for our market of mostly professional DSLR users, it’s probably not a major concern and there are signs that Apple’s approach is improving. One Lightroom strength (version 2.x onwards) is the existence of camera profiles that try to come close to the camera manufacturers’ profiles for popular cameras. That means that they attempt to give you the colour and the look of your manufacturer’s raw converters (e.g., Nikon’s Capture NX) or in-camera JPEGs. They’re pretty good— a clear improvement over Adobe’s standard profiles. 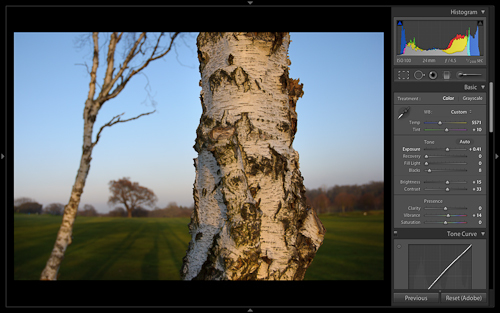 In particular, many Nikon users will find the Camera Neutral profile within Lightroom 2 to their liking. Mostly subjective—you need to download the trials and see how you get on with each application. I initially loved Aperture’s loupe effect but came to dislike it over time. (I no longer use it and just use a full-screen zoom.) Lightroom is what’s called a modal application, meaning that you switch between develop mode, view mode and so on using a keystroke. It becomes second nature when you’re used to it but it does irritate some new users. I loved Lightroom’s interface from the moment I used it—it seemed elegant, clean and simple and offered me the chance to customise its behaviour to my taste. Others have had exactly that reaction to Aperture. Is Aperture 3 good enough to warrant a switch from Lightroom 2? It’s a very strong upgrade for existing users and also a strong offering for new users but most of the switchers are likely to be people who prefer Aperture’s interface. There are lots of aspects we haven’t discussed above, including great book-publishing options, for one, and publishing options with custom book publishers. All this should seem like good news for Lightroom users—a lacklustre or half-hearted Aperture release at this stage would have left Lightroom with little or no competition in this area and the product would have been more likely to stagnate. Now that Aperture 3 has non-destructive brush adjustments and some other improvements, the game is back on. Aperture 3 should prove to be a good enough product to stop the general move from Aperture to Lightroom and put some pressure back on Adobe to continue innovating. In brief: Faces, in its current Aperture 3 and iPhoto incarnations, is unlikely to win over many pro photographers or serious amateurs. It’s a great idea that will one day be genuinely useful. Places is another thing altogether: if you have a GPS unit with your DSLR or use an independent unit like a Garmin, this is can be a real time saver. If you have a large library in either application, you’re probably best sticking with it for the moment. Both offer free trials so you can import all or part of your existing image library into the competing app and compare output quality, speed, interface and functionality. Run them in parallel for a month. With the release of version 3, Apple has shown clearly that the Aperture project is alive and kicking and perhaps the momentum that the Aperture team has gained recently will carry through to an early, class-leading version 4. If you’re starting out, you now have a genuine choice again between competitive applications—something that couldn’t have been said a week ago. Will Shoot Raw be offering Aperture 3 training? We’re certainly looking at the product with renewed interest—that wasn’t the case with Aperture 2, after a short testing period. We welcome your thoughts and we’ll keep you posted. Where to get the trials. The Aperture 3 trial (for UK users) is here. Apple will mail you a download link and a serial number that’s good for 30 days. The LIghtroom 3 public beta (free, expires April 2010) is here. The Lightroom 2 trial is here. Here are our Amazon UK links—all Amazon prices include VAT. Amazon isn’t allowing affiliates to link to the full version of Aperture 3 yet (not sure why) but you can find it here. Aperture 3 is also available at the Apple UK retail store. If you have questions about Lightroom, Aperture or raw workflow in general, drop us a line and if we can, we’ll turn the answer into a new blog entry. ← Edge Detail in Lightroom 3 beta: what does it do?